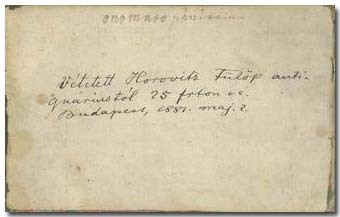 Vétetett Horovitz Fülöp antiquariustól 25 frton. o. e.
* The inscription “onomatophylacium”, much earlier than the present note of 1881, and perhaps contemporaneous to the other notes in the Album, is a playful compound of the Greek words onoma=name and phylakê=custody (cf. gazophylakion=treasury). The unknown noter – perhaps Ferenc Páriz Pápai Jr. himself – gave this name to this album, in which his possessor collected the names and mementos of the persons he met in the course of the one of half decades of his peregrination. Purchased from the antiquarian Fülöp Horovitz for 25 forints. Fülöp Horovitz was born on January 20, 1815 in Boldogkőváralja. He completed the elementary school at home, while the high school in Pest and Pozsony (Bratislava). Then he taught in a private school in Pest, while attending the faculty of medicine until 1845. Between 1849 and 1851 he worked as a doctor in a hospital. Nevertheless, he took an interest mainly in books, and he made acquaintance with several writers of the period. When in 1847 he wanted to open his antiquary, he enjoyed the support of some authoritative writers and literary critics, among whom József Bajza, János Erdélyi, György Fejér and Ferenc Toldy. After 1848 he became the leader of the bookshop founded by Fischer. In 1852 he purchased the shop, and further augmented it. He was generally respected for his expertise and knowledge of the sources of old literature. His bookstore was sold in 1884, and he died in Budapest, on November 22, 1886.